Asylum seekers in Cape Town are struggling to obtain documentation, because they can only apply for refugee permits in Pretoria, Durban or Musina. With no jobs and no money to make their way to these centres, incoming refugees can find themselves stranded. Refugees who need to renew their permits are also affected. RAâ€™EESA PATHER reports. Mangala Mbuwa* arrived in Cape Town a month ago, after fleeing his war-torn village in the Democratic Republic of Congo (DRC). Swallowed byÂ the violent civil war, and forced to fight with a rebel militia group against the Congolese government, he fledÂ the DRC knowing that if the Congolese military caught him, they would kill him. 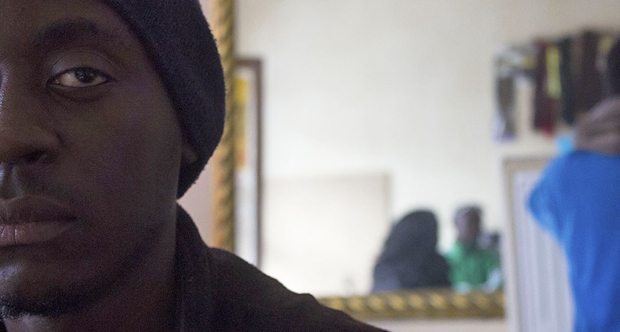 Cape Town was meant to be the beginning of his new life, but the office that takes refugee applications has been shut down, effectively stopping Mbuwa from building a livelihood. In June 2012, Home Affairs director general Mkuseli Apleni made the decision that the Cape Town Refugee Reception Office (CTRRO) would no longer accept applications lodged after 30 June that year. The decision was challenged in the High Court, and after losing the case, Home Affairs went to the Supreme Court of Appeals (SCA), which found the department had acted â€œunlawfullyâ€ and ordered it to consult with relevant stakeholders. But the talks have made no difference: CTRRO has spent three years turning away refugees. The United Nations High Commission for Refugees (UNHCR) told the Daily Vox it understood why Home Affairs had decided to close the centre, but added that it had also alerted government to the high influx of applicants at the Marabastad office in Pretoria. With refugee offices being closed down in Johannesburg and Port Elizabeth as well as Cape Town, the remaining three offices in Durban, Pretoria and Musina have had to prepare for potentially longer queues. â€œThe centre in Marabastad is creating a lot of congestion and a lot of challenges with crowd control. (It) makes it difficult because of the high number of people who have to come to the centre in Marabastad,â€ said UNHCR spokesperson Tina Ghelli. Mbuwa will now have to travel to Durban, Pretoria or Musina to lodge his application. A Musina return trip by bus will cost him around R2,000, excluding accommodation and food. Itâ€™s unclear how long Mbuwa will have to wait in the Limpopo town before a decision is made to accept or reject his application. But unless he finds employment despite being undocumented, he wonâ€™t afford to make the journey. The application process is a lengthy one, which has further fuelled criticisms of Apleniâ€™s decision. Home Affairs closed down the office for a number of reasons, including objections from neighbouring businesses in the CBD who took Home Affairs to court, the high number of economic migrants who abuse the asylum-seeker system, and the departmentâ€™s vision to keep refugee reception offices on the borders of the country, where Apleni has said that refugees would immediately be able to apply for documentation upon arrival in the country. Civil-society interest groups, such as the Scalabrini Centre in Cape Town, which lodged the case against Home Affairs at the High Court, have pointed out that the lengthy process of applications means that refugees would be unable to move from the borders until their paperwork was accepted. The procedure is meant to take six months or less, but according to Marilize Ackerman, an advocacy officer and legal expert at Scalabrini, it can go on for two years or more. â€œHow are they going to survive if they’re not allowed to move around, work, buy food for themselves? Youâ€™re talking really about a camp situation,â€ Ackerman said. She added that South Africaâ€™s policy regarding refugees emphasises integration, where people can meet with families and friends to begin to rebuild their lives within the safety of a social network. The government offers no grants to refugees, leaving them to rely on people they know and meet to help find accommodation and jobs. Mbuwa discovered this when he arrived in Cape Town, and found sanctuary only when a Congolese family he had fortuitously met in the streets of Wynberg offered to take him in. 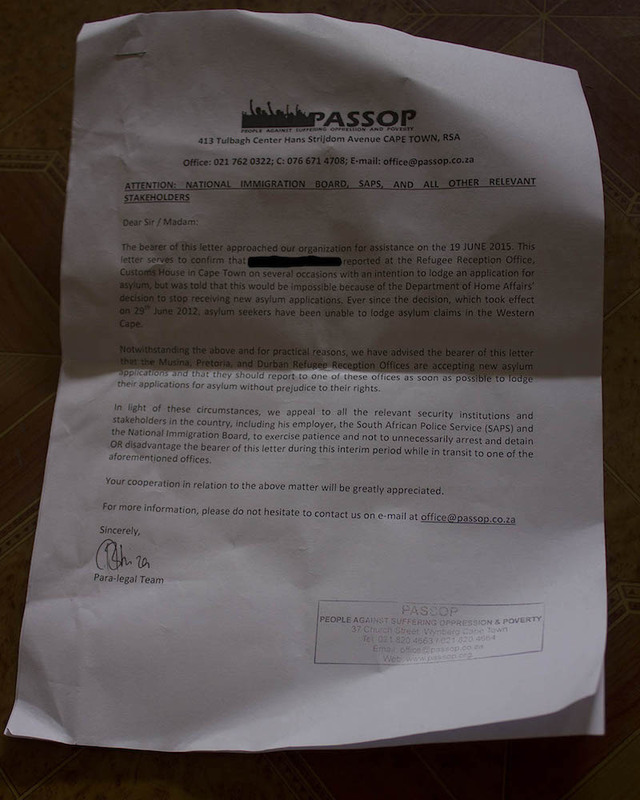 He is now staying in their living room, carrying his only source of documentation: a letter from local refugee organisation People Against Suffering, Oppression, and Poverty (Passop) requesting authorities not to detain him if he is found without documentation because CTRRO has closed. The obstacles weighed against him will continue to grow if Mbuwa chooses to leave the family he has made here, and live in Musina. As of 2013, people are allowed to renew their documents only in the offices where they applied, meaning that Mbuwa would have to travel to Musina every three to six months to renew his papers. Right now he is stuck at home, alert every day to the presence of police who are questioning foreign nationals about their documents as part of the countrywide Operation Fiela. â€œYou canâ€™t go anywhere, you canâ€™t be outside when someone tells you there is cop outside and you must get in the house. Itâ€™s like you are a criminal, but you are not,â€ Mbuwa says.